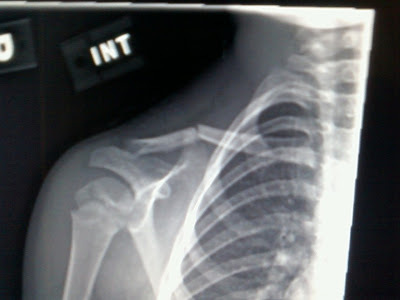 This is an x-ray taken of Raquel's shoulder this morning. She fell off her bed while asleep the night before last causing a clavical fracture. Her pediatrician says its a good thing the broken ends are facing each other, that this will make it heal itself faster. For now, she wears a "figure 8 sling" to hold her shoulders back just a bit and aid in the healing. You noticed I said the night before last? Yesterday morning, Raquel was whimpering about pain in her neck but then she took it back and said she was pretending. At that point, we didn't know what to believe. This was our first experience as parents with a preschool child who is capable of telling plenty of lies and trying to figure out what the heck to do. It was a little aggravating. We ended up keeping her home yesterday and then in the afternoon, through some tests, and despite all the fake giggling and smiling (through tears) Raquel was doing, I discovered she really was hurt. We didn't think it was broken and neither did the doctor, because there was no swelling or bruising and Raquel wasn't complaining too much. The x-ray surprised us all. Maybe Raquel is tougher than we think she is? Her doctor said she could return back to school tomorrow if we felt like she should but I think I'll keep her home one more day. She is very afraid of people touching her arm, pulling or shoving her even the slightest bit. We will take her back in 4-6 weeks for a check up on the break. wow that looks really painful. how high is her freaking bed? why would she lie to you about being hurt if she really was? poor baby. I hope it heals quickly. Oh my goodness Raquel! I am so sorry for her. Gosh she is so tough and brave. Sorry she was not telling the truth. I know you would have jumped on getting her taken care of if it were more clear she was in pain. I guess like you said, she was faking it for the freedom. She LOVES school like no kid I know. When we said she couldn't go if she's really hurt, she changed her story and said she was just pretending to be hurt. Her bed is a normal height and the floor is hardwood. When I was 5, I fell off the TOP BUNK of my bed and had a stiff neck for a while but nothing broke. Go figure? !